One of the big aspects of our experience here in Kumbungu, is the life within our host families. Moving to a new environment is both daunting and exciting. On arrival, you’re in unfamiliar surroundings and it takes time to get used to the new place. Staying with my host family allowed me to be introduced to so many people from the community. They welcomed us with open arms, and I quickly felt more comfortable, secure and generally at ease with the new environment. When I found out about my project I tried to read a lot about my destination’s culture and customs before arrival. But the only way to really get to know them is by experiencing them first-hand. Staying with my family, they have shared an insight into the local life of Kumbungu that other forms of accommodation simply can’t offer. It’s given me the opportunity to “live” in Kumbungu, not just visit it. 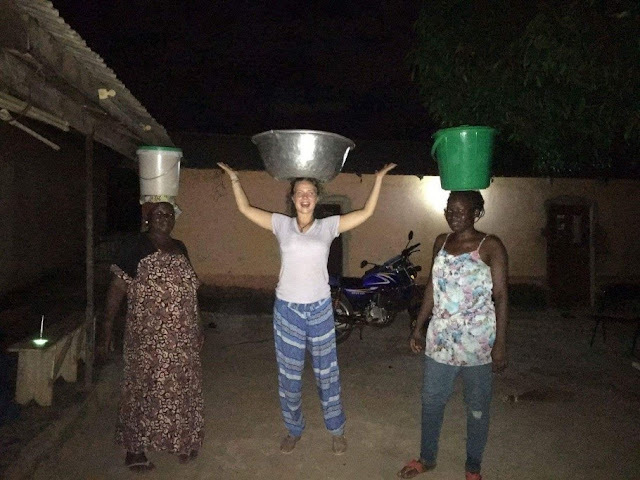 I want to share an insight of my home and family here in Kumbungu. 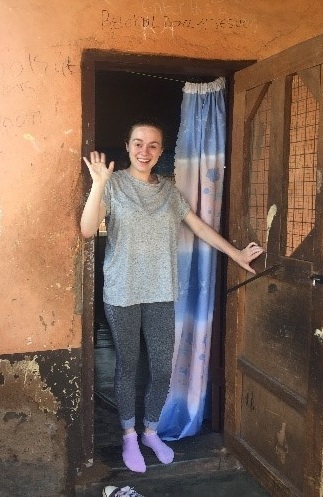 I will give you a tour of our house, as well as share an interview my host sister and my partner to reflect on our stay here so far. 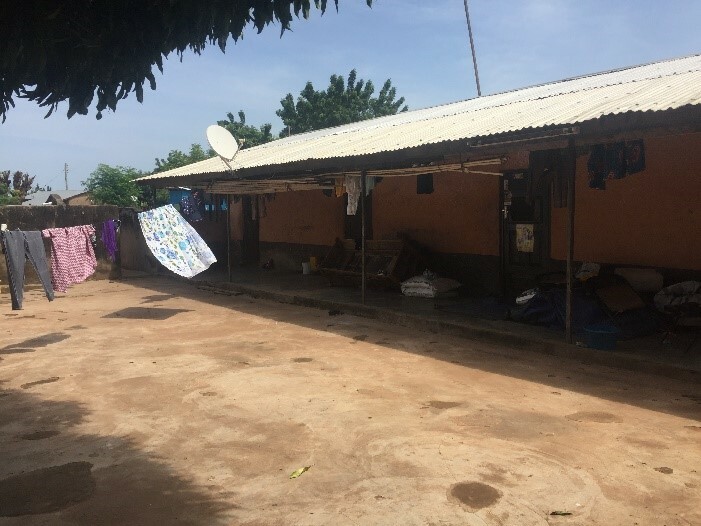 This is our compound where the whole family lives, includes the nuclear family and extended family, such as aunts, uncles and cousins. A total of eleven people live here, 13 with Chloe and I. There is always a lively atmosphere and neighbours and friends come in and out to visit each other. This is the interior of my host home. Picture by: Luisa. 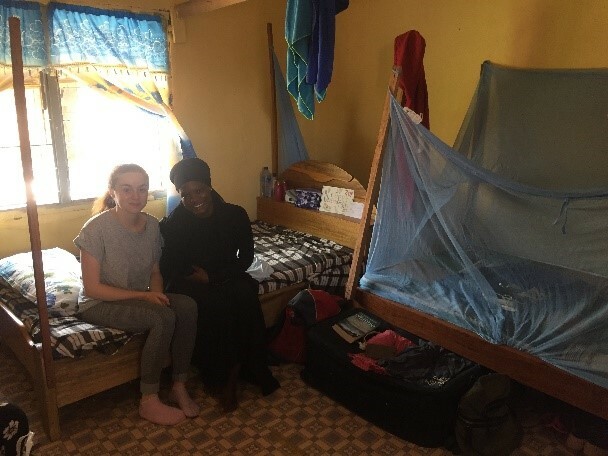 Taiba (an in country volunteer) and Chloe in our room. This is where my family cooks. 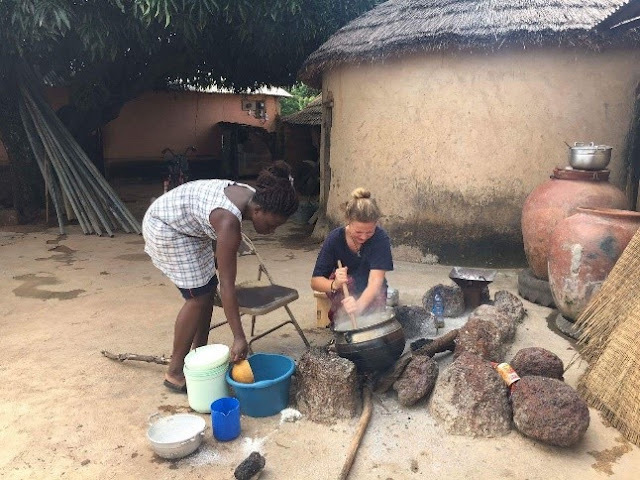 They cook over a charcoal fire; in the picture you see my host sister teaching me how to cook TZ, one of the main dishes in the Northern region of Ghana. It is dough made out of flour and water which then gets dipped into a fish, tomato soup. Say hello to our host mum, Elizabeth and the Landlord of our compound, Ibrahim. 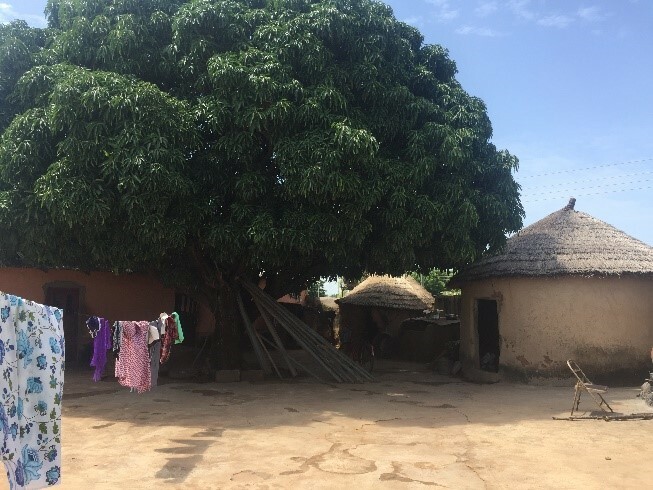 Ibrahim’s dad built the house, he is now buried underneath the big mango tree you see in picture one. It was Ibrahim’s father’s wish to be buried there. He planted the tree and wanted to rest in peace where his grandchildren played. The family often relaxes and chats underneath it when the midday sun is too hot. Meet my host parents, Mr. and Mrs. Ibrahim. Picture by: Comfort (my host sister). 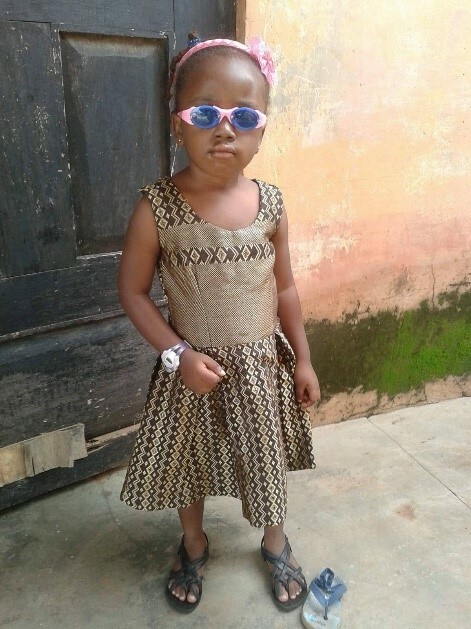 This is Emily, our host niece, all dressed up nicely and wearing her most fashionable sunglasses for church, where the family gathers every Sunday. Going to church is a great way of socialising at the weekends and meeting the people from the community. The service is very nice and there is lots of singing and dancing, which is my favourite part! Interview with my host sister and my ICS partner. Lets read the interesting interaction with my host sister, Comfort. Interviewer (I): What did you hope to gain from hosting volunteers? Comfort (C): Everything that comes with the experience that is gain able. If you have any skills to teach us, any training for us we would appreciate learning those. I: Why did your family decide on having volunteers? C: We decided to welcome you so that we can chat with you and also help you to get to know our way of life and our traditions. So we are hoping you can also gain and learn from living with us. Whatever we have, we also want to give to you. I: What aspects of living with volunteers have you enjoyed the most? C: It is our first time of having new people in our home and we have enjoyed it a lot. We got to know each other and we get on well. We would like to remain in contact with you when you leave and hope to stay friends forever. I: Have you learned anything from volunteers staying here? C: You’ve told us a lot about your country, the British people and the lifestyle. For example, we hand-wash everything whilst you have washing machines. I know the food and water has been a challenge for you; the conditions here are very different compared to your home. Now lets us get to know how my volunteer counterpart is faring in the host home. Interviewer(I): What do you hope to gain from living in a host family? I: What did you think about living in a host home before coming here? C: I was excited to live in a host home but I did have some concerns regarding food due to being a vegetarian. I: What aspects of living in a host home have you enjoyed the most? C: The food, the food is amazing here! 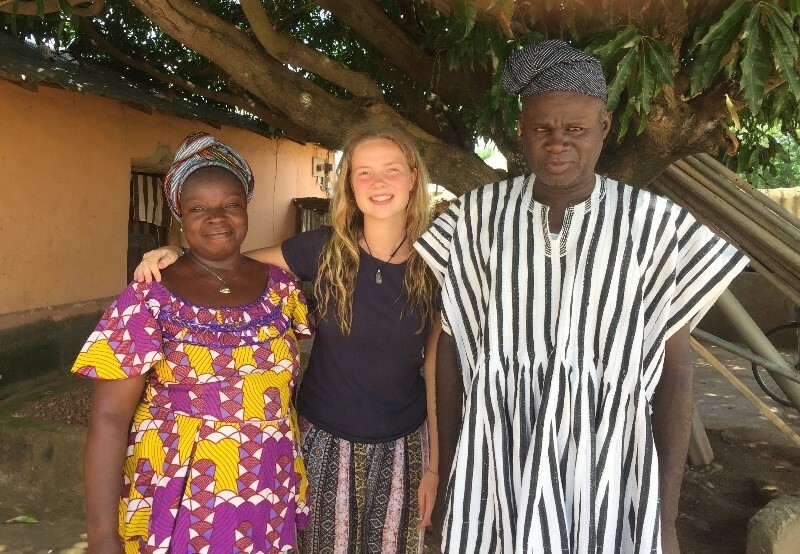 Also I loved learning about the family life here in Ghana and the different family roles. I: So have you learned anything from living with a host family? C: The family life is very different than it is in the UK and there are different roles within the family. For example, marriage is very important, in the community we are living it is tradition that the person who wishes to marry a woman has to give some kind of present to the family of the women he wishes to marry. This gift can vary from different communities, in our village you give some kind of cattle like cows and guinea fowls. That is a tradition we do not have in the UK! I hope you enjoyed this little insight of our very different but fantastic life in Kumbungu. We are very fortunate to have the chance to experience living in such a friendly, fun and loving family. From the moment we arrived they treated us like we were part of the family. 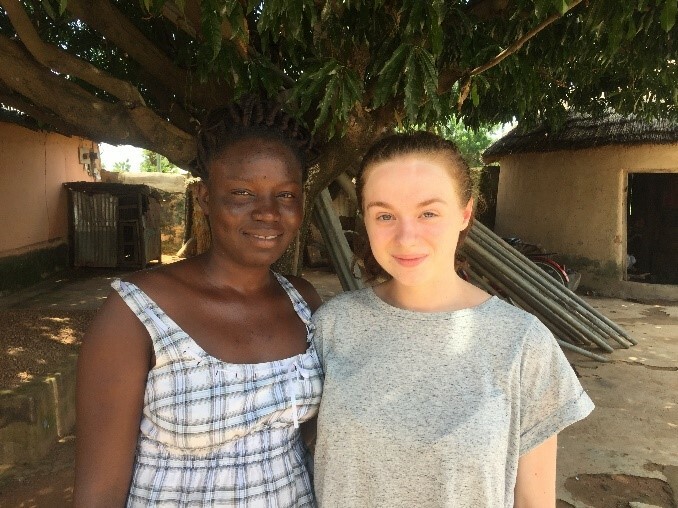 I am not looking forward to saying good-bye to them in five weeks’ time, but we are already planning a reunion for the future, whether it will be in Ghana or back in the UK. The phrase ‘home away from home’ is one that is used far too loosely by different accommodations around the world. While they may offer a homely atmosphere, they are not real homes. Living in a host family, on the other hand, is just that. Despite the worries I had living with complete strangers, these strangers have now become close friends and I would not have it any other way. Staying in a host family, really is staying in home away from home. Written by: Luisa Schumacher (UK volunteer at NFED- Kumbungu).